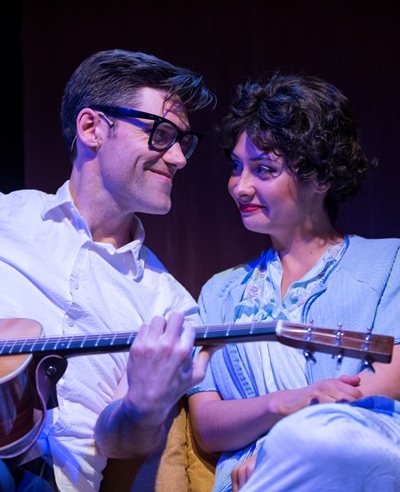 This happy news just in: “Buddy: The Buddy Holly Story,” the supercharged jukebox bio musical that American Blues Theater had planned to unplug May 26, will rave on – after a break – through Sept. 15. This irresistible portrait of Holly’s brief but meteoric life and ground-breaking music should delight anyone with a pulse – and raise it several notches. After closing as scheduled, “Buddy” will reopen June 29 for a lengthy encore extension at Stage 773, the current intimate setting where you can just about reach out and touch Zachary Stevenson’s true-to-life personification of the talented, determined kid from Lubbock, Tex., who rocketed to rock immortality. In a career – if that word even applies – that lasted barely 18 months before his death in 1959 in a plane crash, at age 22, Buddy Holly set his own indelible stamp on the exploding world of rock and roll music. This show, which is by no means a staged replica of the 1978 film starring Gary Busey, offers an up-close look at Buddy’s emergence from a down home nobody with a Stratocaster guitar and a little band to superstar celebrity that stretched from the US. to Australia and the UK. I used the unwieldy word personification for Stevenson’s turn as Holly. That was taking the long way around a word I didn’t want to use: impersonation. Buddy Holly’s amazing blaze exactly matched up with my own adolescence. I was 14 years old when that plane crashed in an Iowa field, in darkness and snow, during Holly’s tour with Ritchie Valens, the Big Bopper (both perished with him) and others. I remember where I was when I heard the dreadful news on the radio. 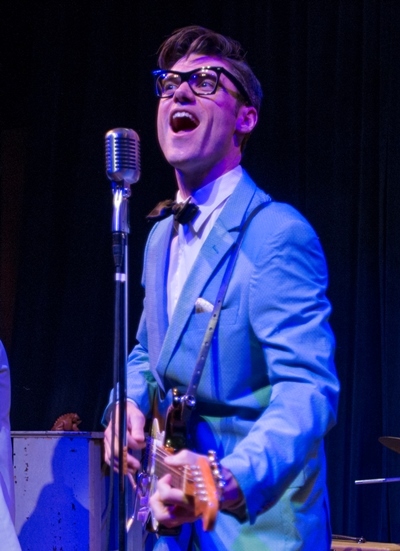 To this day, I know every inflection in every lyric of every hit Buddy Holly recorded. What impressed me the most about Stevenson’s performance was its transcendence – or, if you like, his immersion. 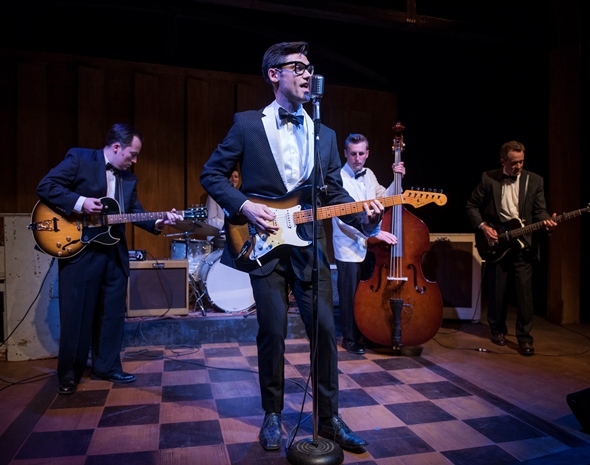 He has the look and the moves and the sound, from punching baritone to magical head voice; but more than that, Stevenson has taken on the aura, the innate spontaneity, of Buddy Holly – without simply stamping a note-for-note copy. Performing artists do not ape their own recordings; every concert is different, however slightly. Stevenson offers a terrific, really quite disarming likeness of a pop music original. It is a living likeness, urgent and seeking and evolving. Indeed, the concept of the show puts Stevenson squarely on the spot. 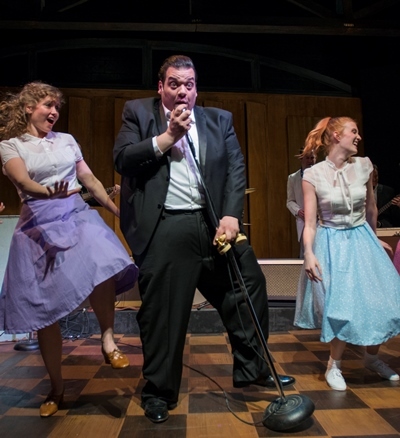 He does great, visceral work with mega hits like “Peggy Sue,” “Rave On” and “Oh Boy,” but to push the narrative along, playwright Alan Janes occasionally cuts away to actual recordings of Buddy Holly. This carries the same sort of peril as the playwright who decides to quote Shakespeare in his play: The qualitative shift can be awkward. Not here. Stevenson’s presence is so convincing, and his backup musicians so good, that the incursions of the real thing never bring the whole ethereal experience tumbling back to earth. Buddy Holly was a skilled practitioner of his Stratocaster, and on that score Stevenson may be just as accomplished. He plays a wicked guitar, and his licks seem inextricably bound up in his on-stage cavorting. It’s all one, it all comes from the same core expressive place. This is the actor melding into the essence of the character. And it brings down the house, again and again. It’s a well-cast production, tight, crisp and fast-paced, directed by Lili-Anne Brown with musical direction by Michael Mahler. In cameo roles, Vasily Deris as the Big Bopper (a.k.a. J.P. Richardson) and Cisco Lopez as Ritchie Valens add generous dollops of style and charm. Historical accuracy gets massaged here and there, but the basic progression of events is right – Buddy’s breakout from Lubbock, the sunburst eruption of his clear-voiced, curiously hiccupy sound with its driving rhythms, his first-date marriage proposal to Maria Elena Santiago (Molly Hernández). It’s great fun to watch Stevenson’s Buddy rebel against one restraining hand of convention after another to forge the infectious style that was crying, waiting, hoping to be free. There’s a naughty version (different from the film) of how “Peggy Sue” got that name, and how its powering drum beat came about. The iconic black-frame glasses are explained, too. But we don’t get Buddy’s two high-profile appearances on the Ed Sullivan Show. I saw them both, and missed them here. We do get him at Harlem’s Apollo Theater, though. What a night that must have been. This white rocker from Texas walks out to face an unsuspecting black audience of New Yorkers. Hello. And he wins them over. That actually happened. Stevenson and the band play a short, high-energy Apollo set, and a handful of black characters are seriously into it. By this point in the show, I’ve separated from the decades of my own life. This is very much the man again. The one who raved, and died. That tragedy remains unmitigated by the years. Huge props to director Brown, set designer Sarah E. Ross, lighting designer Jared Gooding and sound designer Rick Sims – just everybody – for the electrifying gesture of Buddy’s death. On an unresolved chord.